Carlos Acosta, who is artistic director of Birmingham Royal Ballet, said that as the Communist country of his birth continued to open up culturally and economically, it was time for the UK to also build bridges as it left the EU. Foreign Secretary Jeremy Hunt described the visit as “a great example of bold & pragmatic UK diplomacy” in a tweet. Carlos Acosta met Charles and the Duchess of Cornwall after they began their historic trip to Cuba by touring the old quarter of Havana, where they were mobbed by press and the public in chaotic scenes. 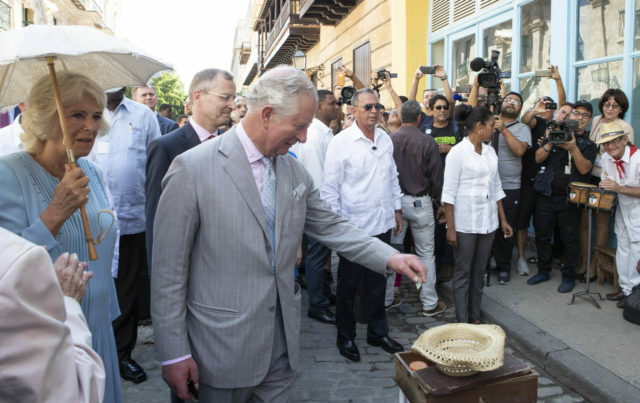 Charles played the tourist when they stopped to listen to a traditional band and dropped a coin in their collection hat, while Camilla’s visit to the capital was sealed with a kiss – a peck on the hand from a street performer. Acosta welcomed Charles and Camilla to his dance company, which is helping disadvantaged young people from across the region fulfil their potential. The dancer said about the visit – a first by members of the royal family: “I think it’s a big, big deal, especially with all the Brexit, the UK is looking for emerging markets and different partnerships and to sort of build bridges with other nations, and Cuba is doing the same, which is really great. Acosta was principal guest dancer for seventeen years with the Royal Ballet and performed many times in front of the prince. He added: “From the Cuban perspective it is a time for building bridges, to reach out to the world, and I think also for the UK they are doing the same with this inevitable Brexit going forward, so I think it’s just the perfect fit. Charles’s visit offers an opportunity for the UK and Cuban governments to forge closer ties in the wake of the soft diplomacy employed by members of the royal family, who use it to make friends and build bridges during foreign tours. During the day the prince visited a boxing gym and joked with fighters about Cuba’s prowess in the ring, which has seen the island punch above its weight for decades. “I suppose you enjoy beating our British boxers?” Charles joked, feigning raising gloves during his visit to the Rafael Trejo gym. Boxing arrived in Cuba as a tourist attraction, mainly as championship bouts between North American boxers during the high tourist season. By 1959, Cuba had six professional world champions who were considered to be the founding fathers of boxing as well national heroes of Cuba. The royal couple were joined during the day by Antony Stokes, Britain’s ambassador to Cuba, who said: “There are some interesting signs in Cuba right now. “Mobile internet services have only really come to Cuba, surprisingly, within the last couple of months. That has made a huge difference in terms of the debate on social media. “Suddenly there is a social media environment in Cuba. That gives us an opportunity to talk about freedom of expression.